For nearly three decades, 1912-1941, family members of Karoline and Meier Mayer were at the heart of the Themar Jewish community; their son-in-law, Moritz Levinstein, was the much-beloved Lehrer. 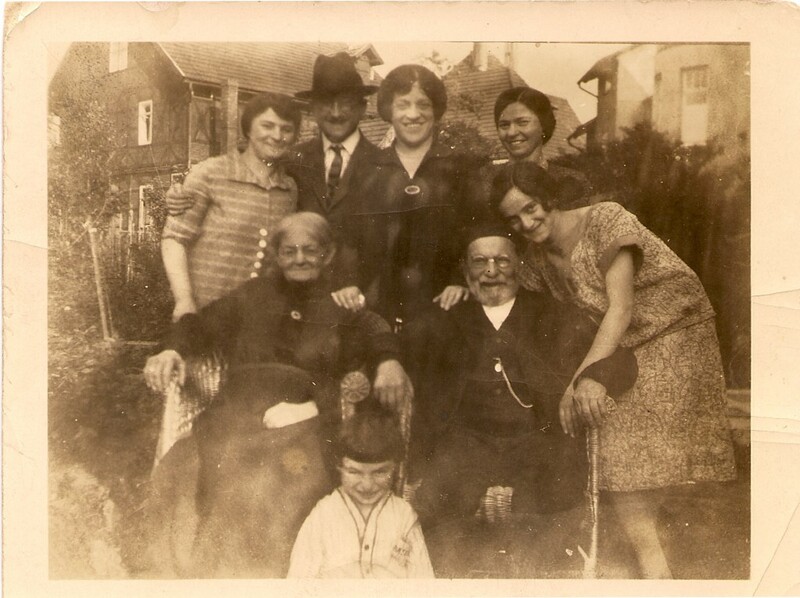 The story of the extended Mayer family contributes much to our understanding of how Jewish families lived and acted within rural communities in Germany in the late nineteenth and early twentieth centuries. The Nachkommenliste/Descendants List attached illustrates how significant emigration was to this large family as a means of securing socio-economic success; by the early 1900s, the Mayer family was divided between Germany and the United States. An important implication of this pattern was that Mayer men fought on opposing sides in World War I with the possibility that one Mayer man might kill his brother or cousin in combat. Nanett Mayer, the youngest daughter of Karoline and Meier Mayer, was the first Mayer to live in Themar, and it was marriage that brought her there. In 1912 she married Moritz Levinstein, who, as the Jewish Lehrer, performed most of the religious tasks in Themar’s Jewish community; as well, he gave Jewish instruction to children in smaller communities such as Marisfeld. And he was the teacher of German language and literature in Themar’s public school. At the time of Nanett’s move, her family was already quite dispersed: Her parents, Karoline & Meier, lived in Schnaittach in Bavaria where Meier had been Lehrer since 1866; Karoline had borne ten (10) children but one had died in infancy. Six of Nanett’s siblings had left Germany for the United States. Five brothers — Jacob/Jake, Abram/Abe, Isaac/Ike, Solomon/Sol, and Adolf left as teenagers in the late 1800s, and Jacob and Abram had both left before Nanett was born. The brothers all lived in the New York area and pursued business careers. They married American-born women (some of German descent) and formed families. One of Nanett’s sisters, Eva, had also left, age 21 in 1894. She too had married in the United States, an Englishman of Dutch background Morris Hambro, and they had three daughters: Miriam, b. 1899, Lisette, b.1903, and Carolyn, b.1911. Please see here for the Eva Mayer Collection of photographs contributed by one of her granddaughters. 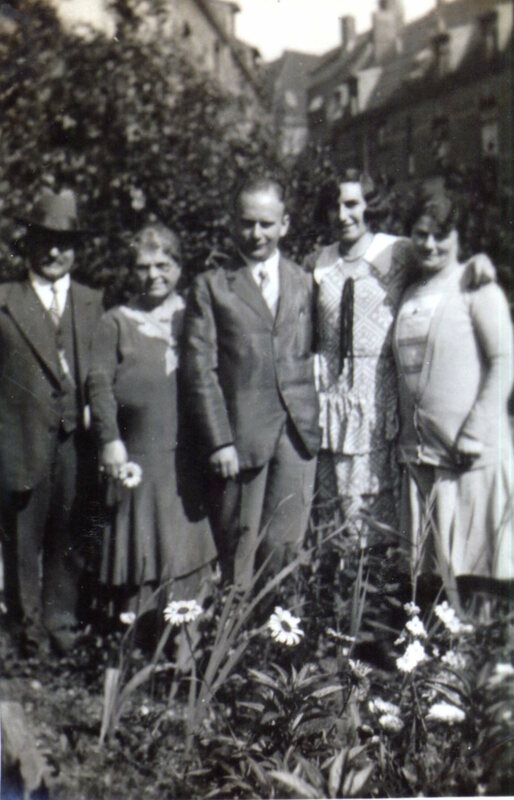 In 1912, two of Nanett’s brothers and one sister still lived In Germany. Moses Mayer, the eldest sibling, had become a Lehrer like his father and from 1891 had lived in the small town of Fürfeld with his wife Mathilde (née Weinstock) and son Ernst. Hermann Mayer lived in Hof, with his wife Hedwig (née Frohmann) and their daughter, Ilse. Frieda Mayer lived in Sülzburg, the hometown of her husband, Heinrich Wolf. She and Heinrich had a three-year-old daughter, Flora. In 1914, Meier Mayer retired from his position as Lehrer in Schnaittach where he and Karoline had lived for close to fifty years. They chose to move to Themar; why they chose Themar rather than Sulzbürg, Fürfeld or Hof, is not known. All were towns of similar population size so the decision may have been determined first by the wish to live near a daughter and then to live near the one who had no other family support in the town. (Frieda’s inlaws lived in Sulzbürg). Since Nanett and Moritz lived above the synagogue in Hildburghausenstraße 17, Karoline and Meier required separate housing. Two of Karoline and Meier’s sons in America paid for the construction of a handsome at Schulstraße 9, distinctive in that it did not reflect architectural styles in south Thüringen towns. In 1914, Meier Mayer retired from his position as Lehrer in Schnaittach where he and Karoline had lived for close to fifty years. They chose to move to Themar; why they chose Themar rather than Sulzbürg, Fürfeld or Hof, is not known. All were towns of similar population size so the decision may have been determined first by the wish to live near a daughter and then to live near the one who had no other family support in the town (Frieda’s inlaws lived in Sulzbürg). Since Nanett and Moritz lived above the synagogue in Hildburghausenstraße 17, Karoline and Meier required separate housing. Two of Karoline and Meier’s sons in America paid for the construction of a handsome at Schulstraße 9, distinctive in that it did not reflect architectural styles in south Thüringen towns. On the American side, the American forces registered 43-year old Abram Mayer as well as Jacob & Sophie’s son, Samuel R. Mayer; since the registration occurred in September 1918, neither probably went oversees. But Meier and Karoline’s youngest son, Adolf, did serve abroad and sent a postcard to Nanett in Themar from the front. After the war, Frieda, newly widowed and with two young children, moved to Themar to be near her parents and Nanett. The Wolfs lived with the Mayers at Schulstraße 9 and the Levinsteins lived above the synagogue at Hildburghausenstraße 17. In 1919, Heinrich Levinstein was born. brought her three daughters to Germany: in 1906 she travelled with Miriam and Lizette and in 1930 she brought her youngest daughter Caroline. In 1926, at ninety years of age, Meier Mayer died and was buried in the Marisfeld Jewish cemetery. The house in Schulstraße came to be known as the “Villa Wolf” and, at some point either in the late 1920s or early 1930s, Karoline Mayer’s sister, Klara Eisenfresser, b. 1848, came to live in Themar. She too lived in Villa Wolf. 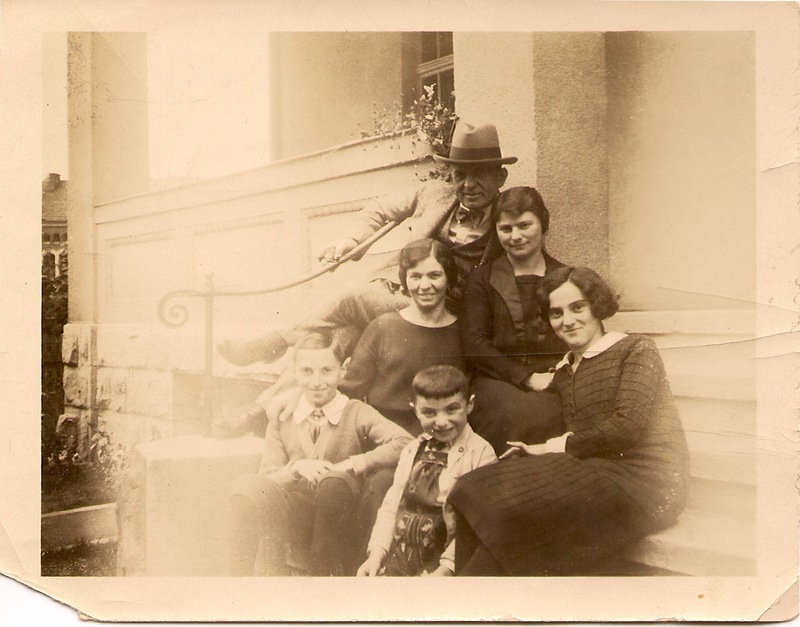 When the Nazis formed the government in January 1933, there were 20 members of the Mayer family living in Germany, in Themar, Hof, and Köln, Nazi government policies affected the Mayer families in Themar immediately. On 7 April 1933, the Nazi government passed the Law for the Restoration of the Professional Civil Service, excluding Jews and political opponents from all positions in public institutions. In July 1933, Moritz Levinstein received his letter of dismissal from his position as a teacher in the Themar public school. 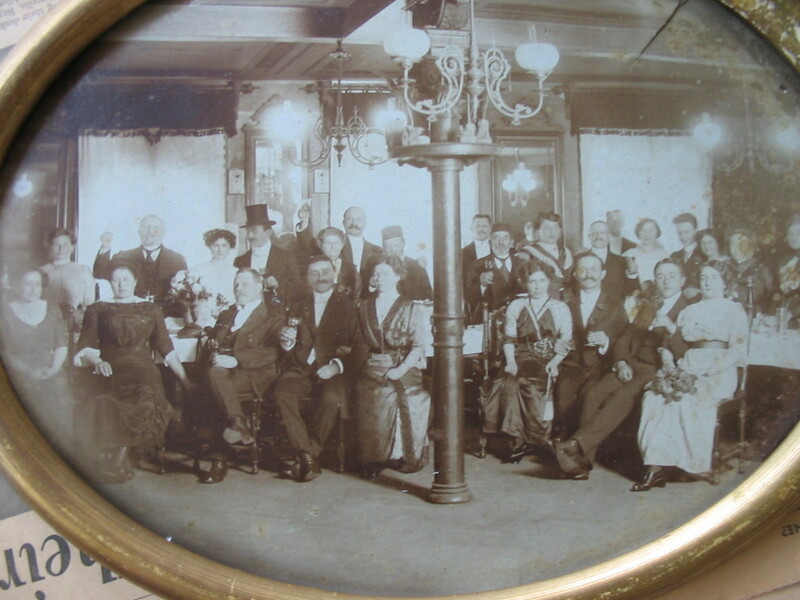 Given the number of Mayers living in the United States — there were about 20 adult members in the United States.— and the family’s familiarity with the strategy of emigration, the Mayer families immediately arranged for young members to leave Germany. The Wolfs and Levinsteins were thus among the first of the Jewish families in Themar to arrange for their children to leave Germany. On 23 March 1934, 21-year-old Albert Wolf, who was living in Munich at the time, left from Bremen, sponsored by his uncle Abe Mayer, who lived in St. Alban’s, New York. Just over a year later, on 16 May 1935, Heinrich Levinstein arrived in New York, sponsored by Uncle Ike, also living in St. Alban’s, New York. The brothers were probably also willing and eager to sponsor those family members still in Germany. Moses had retired and lived with his wife Mathilde Mayer in Köln. Ernst, their son, had married a non-Jewish woman, Johanna in 1929; they lived in Köln. Hermann and Hedwig lived in Hof and their daughter, Ilse, and her fiancé/husband, Ferdinand Odenheimer, were also still in Germany. Nanett and Moritz Levinstein and Frieda Wolf and her daughter Flora continued to live in Themar as did Karoline and Klara, both in their late 80s. The story from 1935 on became increasingly complicated: For Nanett and Moritz Levinstein, the story ended in tragedy. in May 1935, Nanett accompanied her 16-year-old son to New York, visited with family, and then returned to Themar. In 1937, Nanett and Moritz travelled together to the United States to visit Henry — as he was now known — in his new surroundings, but then returned to Themar. A year later, Moritz Levinstein was arrested in the Kristallnacht pogrom and imprisoned in the Buchenwald concentration camp with the other 17 men rounded up in Themar. We know that Moritz was not housed in the same barracks as the other Themar men and that he did not return to Themar alive. What is unclear is whether he was murdered in Buchenwald and his body dumped in the Werra River to be ‘found as a suicide’, or whether he took his own life. There is evidence in the Themar City Archives to suggest the former, but the official records state the later. 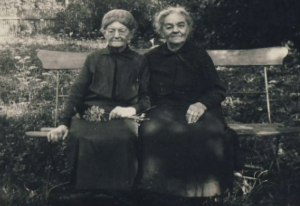 Frieda and Flora Wolf, Nanett Levinstein, and Karoline Mayer and Klara Eisenfresser continued to live in Themar: Karoline lived with Nanett, Klara with Frieda and Flora. in summer 1938, Flora Wolf married Herbert Müller and Herbert moved into Villa Wolf. Herbert was arrested on November 9/10 and, after his release from Buchenwald in December 1938, the couple actively sought a route to emigration from Europe. 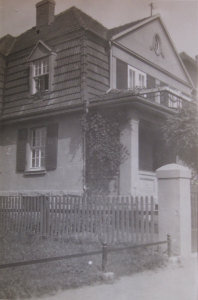 In early 1939, Flora and Herbert moved briefly to Köln so that Herbert might acquire some new skills that he might use in a refuge country; they stayed at the home of his cousin Ernst Mayer in Thurnerstraße 90. Frieda and Nanett also applied for immigration papers to the United States. Arrangements were made for Karoline Mayer, and her sister, Klara Eisenfresser, to move to Berlin to live in an Altersheim/Old People’s Home at Berlinerstraße 17, Wilmersdorf. In early 1939 the two women moved, accompanied by Frieda Wolf who stayed on in the city, and both women died in early 1940. Luck favoured Nanett and Frieda and both left Europe on some of the last ships to carry refugees in the summer of 1941: on 21 June 1941, Nanett travelled alone (without her luggage which had been stolen) from Barcelona to New York on the Villa de Madrid; on 29 June 1941, Frieda Wolf left Lisbon with Flora and Herbert Müller on the Excambion. For those Mayers elsewhere in Germany — the Mose Mayers in Köln and the Hermann Mayers in Hof — the story between 1937 and the start of WWII in 1939 was also one of death and emigration. In 1937 Moses Mayer died in Köln and his wife, Mathilde, died in early 1939. In Hof, Hermann’s first wife, Hedwig, died in February 1938. in July 1938, Abe Mayer sponsored Hermann’s daughter, Ilse, and her husband, Ferdinand, to immigrate into the United States. Hermann married again, and moved with his second wife, Anni, to München. Once in America, Ilse and Ferdinand attempted to bring Hermann and Anni to the States but their efforts failed.. In September/October 1941, therefore, when it became impossible for Jews to leave Germany for safety in other lands, four members of Meier and Karoline Mayer’s family were still in Germany: Ernst and Johanna Mayer in Köln and Hermann and Anni Mayer in München. Ernst Mayer had been reluctant to consider emigration and, although stripped of his formal credentials as a dentist, had continued to serve Jewish clients until the late 1930s. Owing to the fact that the family lived in a suburb of Köln with few if any other Jews in the neighbourhood, Ernst had escaped imprisonment during the Reichspogromnacht of 9/10 November. Possibly he hoped that marriage to a non-Jewish woman would provide him with the protection accorded to Mischehe/marriages between Jews and non-Jews. The first deportation from Köln occurred on 21 October 1941; the first trains left München on 20 November 1941. In early August 1942, Hermann and Anni took their own lives in München just days before they would have been deported on 12 August 1942 to Theresienstadt. In Kôln, where the Ernst Mayer family had avoided deportation for years, the receipt of transport papers in late 1944 indicated that any protection they had enjoyed was over. In September 1944, Ernst and Johanna Mayer, with their daughter, Renate, born December 1943, left their home to live with one of Johanna’s brothers in a farmhouse outside the village of Hilgen. Here they stayed until the Americans liberated the city and they could return to their home. After 1945, there was but this one family of Mayers still living in Germany and Ernst Mayer and his family retained contact with their cousins in America. During the subsequent years, cousins from America — Herbert Müller and Henry Levinstein for example — visited Germany. The end of the Communist Era in 1989 prompted visits to the former East Germany and an article written by Robert Strauss, stepson of Henry Levinstein, in 1996 captured the feelings of those who did return to Themar. 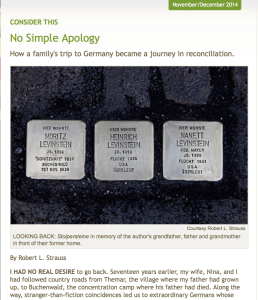 Robert Strauss’s article contributed significantly to the creation of this website in 2009 and to the actions of the City of Themar in reaching out to the families of its former Jewish residents and welcoming them back to their ‘hometown.’ In 2011, members of the family of Frieda Wolf (née Mayer) and her daughter Flora Müller gathered in Themar with the descendants of other Themar families. The “Themar Treffen” video of 2011 features them relating anecdotes about the family in front of the house in Schulstrasse 9. 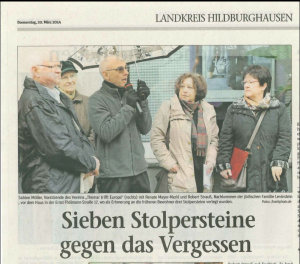 In 2013, Robert and Nina Strauss, and their daughter (about to be born in 1996), returned to Themar to participate in the commemoration of the 75th anniversary of Kristallnacht, the Reichspogrom of 9.10 November 1938. With them were Renate Mayer-Merkl, daughter of Ernst Mayer, and her husband Joscha, who live in Köln in the house owned by Renate’s parents since 1936. In 2014, the Strausses and the Mayer-Merkls returned to Themar for the laying of Stolpersteine for the Levinstein family in front of the former synagogue at Ernst-Thälmann-Strasse 17. Robert Strauss has written another story which can be found here. The Descendants List identifies fifty-four (54) members of the families of Meier and Karoline (née Eisenfresser) Mayer, both those born in Germany and in the United States, before 1945. We wish to thank all the members of the Mayer families who have contributed so generously to this website. Items from their personal archives appear throughout the site and more will be displayed as we develop more pages about the various branches of the families. 1. The official date/place and cause of Moritz Levinstein’s is given as 6 December 1938 at Vachdorf, a village near Themar, a result of suicide. However, evidence in the Levinstein/Strauss Family Collection as well as in the Themar City Archives suggests that the Nazis murdered Moritz Levinstein in late November 1938 and then tried to cover up the murder by staging a suicide in the River Werra.